I need this sofa in my life. We actually belong together. Saw it on Anna Spiro's blog and almost cried tears of happiness. 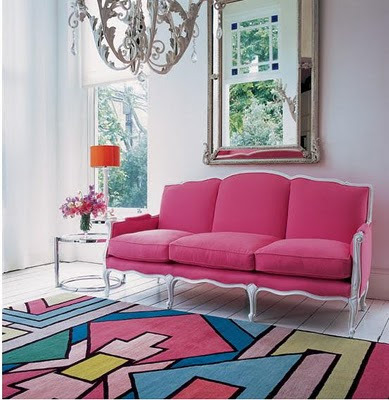 Love the rug too. Have discovered a fab company in Sydney called Culla Change. They can dye anything from pillows to slipcovers to your wedding dress. They list their prices on their site. I might get my white sofa covers dyed pink for around $185 AD. There are distinct advantages to having a colored blind husband. Aww. I love the pattern! It's so abstract. Though I'd love to it to be in color blue. I have a collection of rugs. I rely on carpet cleaning (Greensboro, NC) services to do the job, though. I'm not an expert in removing dirt and other damages of my beautiful carpets. The Greensboro carpet cleaning guys already know how I want my rugs to be taken care of. What I most like about their service is the deodorizer.